It’s smoking season and anything that involves Brock’s smoked trout is a winner in our house. 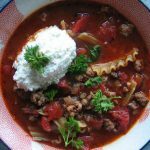 I found this recipe in Sara Moulton’s book, ‘Home Cooking 101’, and it was marvelous. If your chopping is done ahead of time, this is very manageable on a weeknight, and it easily fed the 4 of us with a salad – enjoy! Melt the butter in a large skillet or pot over medium-low heat, then add in the leeks and salt, cover and cook, stirring occasionally, until the leeks are very soft – this will take 10 to 15 minutes. 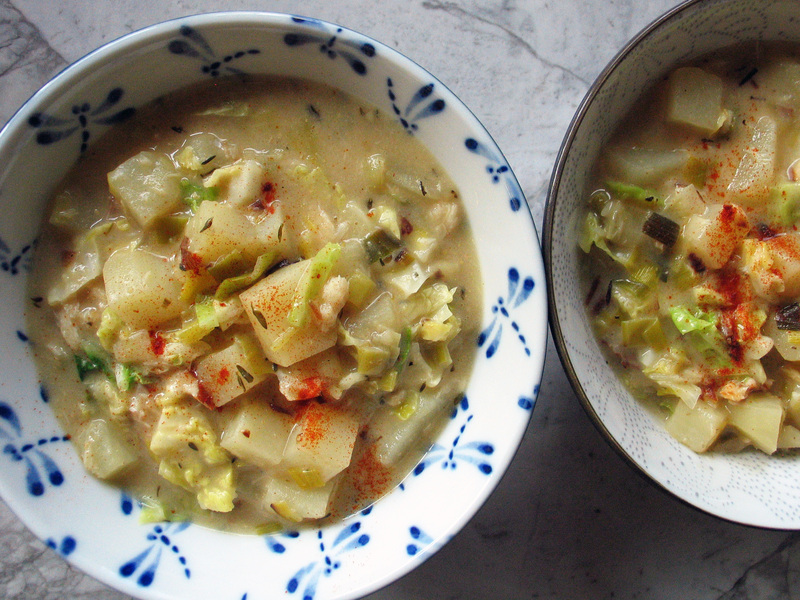 In the original recipe, she suggests placing a round of parchment over the leeks as they cook (steaming them I would think), so that they don’t brown and your chowder stays a lovely ivory color…I tried this, but I’m not sold yet – will keep you posted and update when I make it next. Next, sprinkle in the flour, cook and stir for a couple of minutes, then increase the heat, whisk in the broth and bring it to a boil. Add in the potatoes, milk and thyme and simmer, stirring occasionally, until the potatoes are tender (10 to 15 minutes), then stir in the cabbage and cook for a few minutes more until the cabbage is tender also. Add in the fish and lemon juice and cook until all is heated through, season to taste with salt and freshly ground pepper, then ladle your goodness into bowls and garnish as you would.